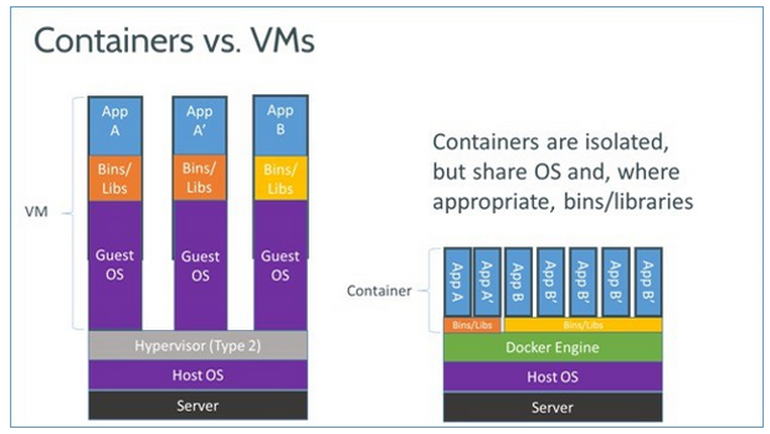 However, based on the picture attached below, we can see that the Docker Engine is an abstraction layer between the HOST OS's system and utility libraries and the application container. Why are we not REUSING the system cron that comes with the HOST instead of installing cron INSIDE the container? It almost feels redundant. My understanding of docker is you'd install application level libraries and packages like npm node modules INSIDE your nodejs app container for example but if you need a system utility like cron, then you would somehow call back out to the HOST OS's native cron utility; so why not use the HOST's cron within our container somehow, why reinstall cron inside the container? Lastly, would you use docker-compose instead and separate out the cron service into its own container then somehow have the cron service talk to the application container and referencing its environment vars? I mean the environment variables defined in the app container; making those accessible to the cron container? So that we may follow best practice of one service per container? As far as I'm aware, modern container applications use some form of scheduling from the host (eco)system. You could use cron on the host machine to trigger docker run commands. You could use a general purpose scheduler like Airflow. You could use a full-fletched container platform like DC/OS, which come with built in scheduling services. There is nothing wrong with running cron together with your application inside a container per se. However, if you trigger the application container from a scheduling service outside your application container, your container would terminate after the job is finished, thus releasing any resources to other applications. Secondly, it's considered good practice to have one container per service. Cron is a service in itself. Not the answer you're looking for? Browse other questions tagged linux docker cron docker-compose cron-task or ask your own question. How to run a cron job inside a docker container?